Due to the fact that you were completely unprepared for this impromptu meeting, you didn’t write down any notes from the discussion that you just had, and you are now struggling to remember everything that was asked of you. Since your manager was pissed, you can’t really go and ask him to recap the questions that he asked of you (well, yes, you could, and that is actually what you would do, but let me try to illustrate my point). You should have started writing things down as he started asking them but you can never find any paper when you need it, and your pen never works!! Argh!! 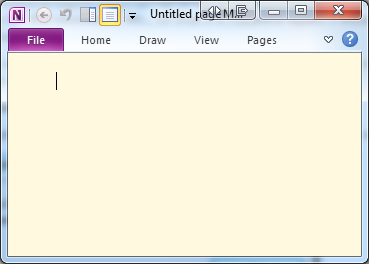 This isn’t the full OneNote application, but rather a stripped down version of it, with some rudimentary formatting options, and a space to start entering text. As a result, it opens almost immediately, and you can literally start typing directly into it. To follow on from the situation above, as your manager is harassing you with questions, you can quickly jot down some notes from the discussion, and then expand on them later, once he has gone. This is where all your “quick” notes end up. The idea being that you either delete them once you are finished with them, or you add them into one of your other Notebooks or sections. Hit “Windows Key + N” – ready to start writing notes for the discussion you are about to have.